There are speeches, and then there are great speeches. As public speakers it’s the great speeches that we want to give; however, how is one to go about creating such a speech? It turns out that creating a great speech really is not all that hard to do if you know how. The first thing that you have to do is to realize that a great speech is one that your audience will enjoy listening to. However, even more important than that is that long after you are done speaking, they are going to remember what you said. A great speech is one that “sticks” with your audience. Your speech is also going to have to be persuasive. Every speech that we give is given for a reason. We want to change the way that our audience views their world. This means that you are going to have to change their minds. The key to doing that in a great speech is to find a way to be persuasive. Tap into your audience’s desire to believe in something and make them believe in you and your ideas. We can all learn how to transform a plain ordinary speech into a great speech if we know where to look. There are great speakers out there who have tips for us. We can learn how to add humor to our speeches and we can learn how to write better speeches in the first place. All of these things are possible, you just have to be told how to do them. 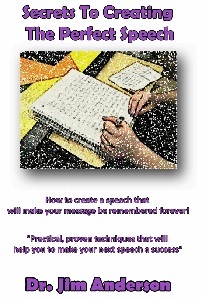 That’s exactly what this book is all about – how to create the perfect speech. We are going to step you through each of the different techniques that you can use to make your next speech unforgettable. Speech perfection is within your grasp!